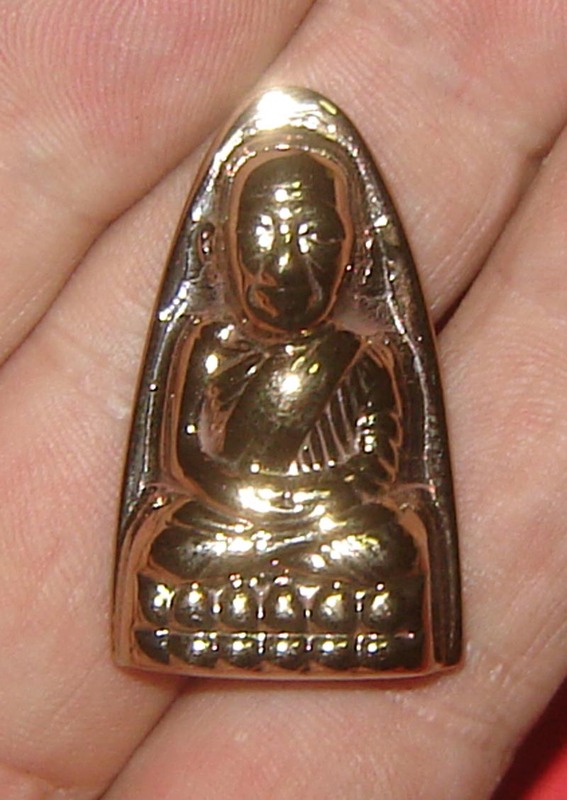 Pra Luang Por Thuad – Pim Tao Reet – Nuea Lek Lai Nam Neung See Tong Pla Hlai (LP Thuad amulet made from pure Golden Lek Lai) – Luang Por Hone (Huan) – Wat Putai Sawan. This Lek Lai Luang Por Thuad image in the Meditation posture, was charmed into existence by Luang Por Hone of Wat Putai Sawan. The amulet is made from pure Cave Lek Lai (Lek Lai Tham) . This is the Authentic Ancient Lek Lai, which is obtained with the use of powerful ancient sorcery (Wicha). It is rare to find amulets which are made from authentic cave Lek Lai, and these from Luang Por Hone are perhaps the best examples of magical amulets made using supernatural forces in existence, be it modern or ancient times, these amulets are becoming the reference model, for the reason that the ceremony of calling and forming the Lek Lai was done in front of witnesses and even photographed. Dimensions; 3.5 Cm high 2 Cm wide (4.5 Cm x 2.5 in a case) – Postage is included in the price.